Good education requires quality teachers - it’s no secret that without quality education, we risk a low-quality Australian future. While experienced Australian teachers are paid relatively well compared to the rest of the world, the industry is struggling to address systemic problems in quality teacher job satisfaction and retention. So, what’s the low down on teacher salaries in Australia and why are some of our teachers so unhappy? Till now, there has been no systematic study of the reasons why teachers are leaving. This situation will improve with the new ATWD (Australian Teacher Workforce Data Strategy) which will provide nationally consistent data on teacher demographics, employment statistics, types of contracts, career paths, teacher experiences and how many teachers leave and enter the profession. For VET specifically, the number of qualified teachers/trainers has fallen over the past 5 years and is expected to fall even further from 30,400 in 2018 to 25,700 by 2023. With increasing student numbers in vocational education (due to overall population growth and continual rise in school enrolment), recruitment and retention of quality teachers is a major concern for RTO managers. There will be an estimated 10,000 job openings for trained VET teachers over the next 5 years (that's about 2,000 a year). Some of these job openings will be from new jobs being created, but most will come from turnover. VET teacher salaries have the potential to vary across Australian states and territories. Under the AQF (Australian Qualifications Framework), schools, VET & higher education have their own rules and awards in relation to salary and working conditions. Under the Award, the minimum wage for academic teachers ranges from $51,619 to $88,215 while for tutors/instructors it is $49,117 to $64,289. 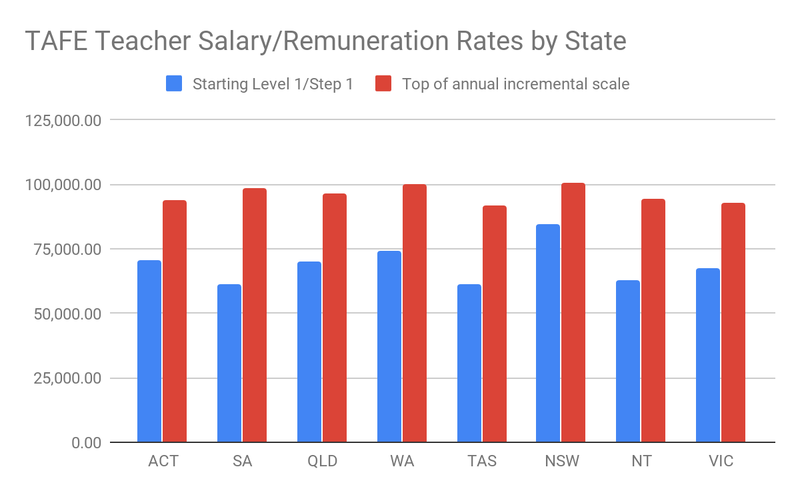 When it comes to TAFE teacher salaries, each state has its own Enterprise Agreement with salaries that are higher than the national award. TAFE teacher salaries increase on a scale according to experience and qualifications. For example, in 2019 a graduate teacher in Victoria will start on a salary of $67,418 and senior educators will earn $104,416. In Western Australia, new teachers can earn more - $74,204 rising to $111,838 for a principal lecturer. While in Tasmania the starting salary is lower - around $61,000 - but increases to $145,714 for senior teachers. See the graph below. 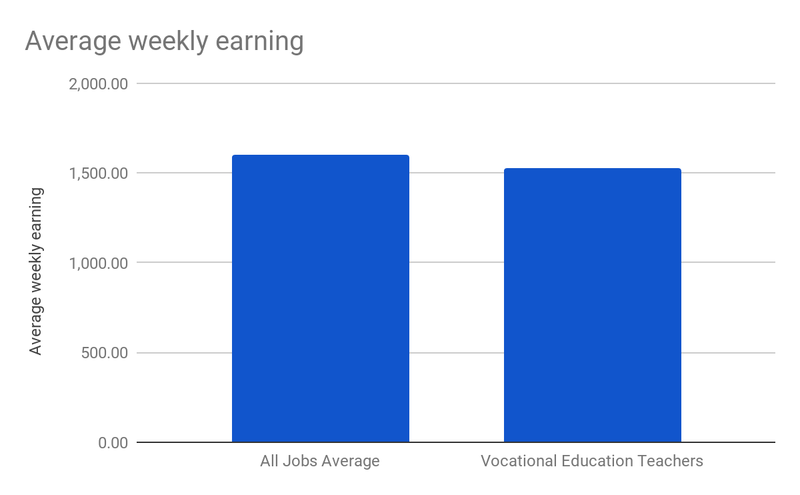 Across the board, a VET teacher who teaches one or more subjects at a TAFE, polytechnic or other training organisation will bring home about $1524 a week before tax, working full time (approximately $79,248 p.a). This is slightly under the national average of $1604 a week (as of November 2018). 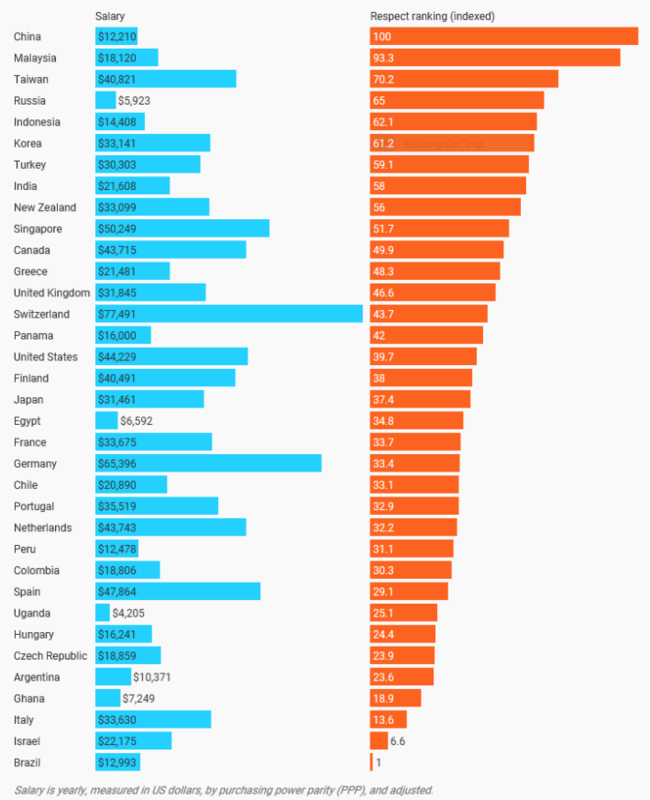 How do Australian teacher salaries fare globally? Teacher salaries in Australia are higher than many developed nations including New Zealand, France, Japan and the Netherlands. In fact, teachers in Australia will reach the top of the pay scale in just 9 years compared to the OECD average of 25 years. Not surprisingly, there is a huge disparity between the highest and lowest paid teachers around the world. Teachers in Luxembourg earn the most - at $70,000 USD for freshers increasing to $124,000 USD for senior educators. Switzerland, Germany, Canada, Korea and Austria all pay teachers well above their peers in the USA, France, Finland and Italy. Meanwhile, even after 15 years' experience teachers in Lithuania, Slovak Republic, Czech Republic, Poland and Hungary earn less than $30,000 USD. The reason Australian teachers are unhappy is not just about the money. People are drawn to teaching professions for a variety of reasons - the desire to positively impact others’ lives, to give back to society and to improve the quality of education in our country. If such aspirations are turning to despair, it begs the question- how much do we value teachers? An interesting survey by the UK's National Institute of Economic and Social Research has ranked 35 countries by teacher salary and respect for teachers. Not surprisingly, in several countries’ teachers are not only paid a measly sum but are also largely undervalued by society. In 28 of 35 countries, teachers are being paid less than what people consider to be a fair wage. The report highlights a key finding - both high teacher pay and high status are necessary to produce the best academic outcomes for pupils. Unfortunately, Australia was not included in the study (results below). Quality teachers are needed for quality teaching. Teacher salaries in Australia are keeping up with the national average (just) and are on the higher side compared to teachers globally. But Australia is losing quality educators, particularly new graduates, from burnout and job dissatisfaction. Increasing teacher salaries may be part of the solution - but money alone is not the answer. More respect for the teaching profession as a whole will go a long way towards creating a higher quality teacher workforce, better academic outcomes and a brighter future.